Welcome to The Incarnate Process episode 11 – Kynazarr Rough. 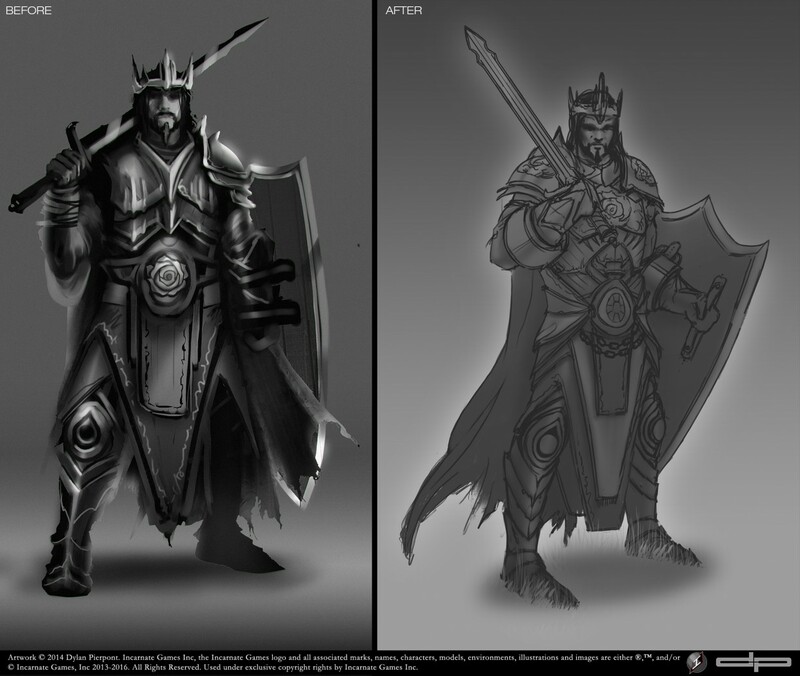 As linework by Dylan Pierpont for Dlone Kynazarr began it certainly was a treat to see this King start to come into form. We were super pleased with the results Dylan was delivering. You will notice that the pose changed a bit, and we think that the piece benefited greatly from that. Here we are guys. This is the base rough for the final Kynazarr illustration. As you can see the pose is the same to that of the center tonal. However I chose to turn the figure in a slight 3/4 view to give him a bit more character and re-position the sword so it wasn’t shooting through his head like in the original. I have a few last subtle shifts in his weight to introduce before finalizing the pose. But of course we can also discuss any feedback you may have. This is fantastic! I like the positioning choices that you have made. It appears that you have included all the final elements that we discussed; I am very pleased with these results. As far as feedback, I noticed that we never addressed that he should have a scabbard to sheath his sword, not a major design addition I would suspect, seeing as it would mostly be invisible in this pose anyway. I really like the way you fixed the shield. I still want to mention that his biceps should be bigger. The reason for this is because King Eloden is going to be a really big beastly guy, I envision Eloden as a berserk/brute force sort of character; so I would like for Kynazarr to at least appear that would still be strong enough to take him on hand to hand. Don’t get me wrong, as he is now he looks very powerful and I love everything about this image. However I anticipate that if this image were to be set side by side with Eloden there would be no doubt that Eloden would look more powerful (as he should) but lets give Kynazarr a fighting chance. Could we bulk him up? Can do! Sheath and bulkier arms. I’ll have an update posted tomorrow! Also, I’m not sure I ever asked. But you mentioned his crown would be removed and locked into some armor on his arm. Given the size of his soon-to-be biceps, I imagine this locking mechanism would be located somewhere on his forearm bracer, yes? Yes I noticed this as well. That thick ring portion of the bracers that he has look like they would accommodate the locking mechanism perfectly. Stay tuned for EPISODE # 012: Kynazarr Rough part 2 which will be posted soon!